Men Socks There are 84 products. 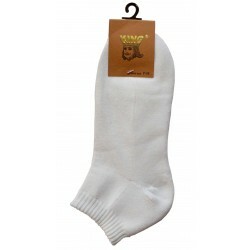 Color: Plain WhiteSize Range: 7-11Materials: COTTON/NYLON/ELASTANEDescription : Men's cotton ankle half cushion sports sock. Color: Plain BlackSize Range: 7-11Materials: COTTON/NYLON/ELASTANEDescription : Men's cotton ankle half cushion sports sock. Color: White/Black SoleSize Range: 7-11Materials: COTTON/NYLON/ELASTANEDescription : Men's cotton ankle half cushion sports sock. Color: White/Navy Blue SoleSize Range: 7-11Materials: COTTON/NYLON/ELASTANEDescription : Men's cotton ankle half cushion sports sock. Color: White/Grey SoleSize Range: 7-11Materials: COTTON/NYLON/ELASTANEDescription : Men's cotton ankle half cushion sports sock. Color: White/Royal Blue SoleSize Range: 7-11Materials: COTTON/NYLON/ELASTANEDescription : Men's cotton ankle half cushion sports sock. Color: White/Dark Grey SoleSize Range: 7-11Materials: COTTON/NYLON/ELASTANEDescription : Men's cotton ankle half cushion sports sock. Color: White/Black Sport SoleSize Range: 7-11Materials: COTTON/NYLON/ELASTANEDescription : Men's cotton ankle half cushion sports sock. Color: White/Red SoleSize Range: 7-11Materials: COTTON/NYLON/ELASTANEDescription : Men's cotton ankle half cushion sports sock. Color: White/Light Blue SoleSize Range: 7-11Materials: COTTON/NYLON/ELASTANEDescription : Men's cotton ankle half cushion sports sock. Color: White/Dark Purple SoleSize Range: 7-11Materials: COTTON/NYLON/ELASTANEDescription : Men's cotton ankle half cushion sports sock. Color: Black/White Sport SoleSize Range: 7-11Materials: COTTON/NYLON/ELASTANEDescription : Men's cotton ankle half cushion sports sock.